this blog is all about baking, cakes and anything yummy! The little boy was so into Nerf Gun that the games for his birthday all revolved around this gadget. When I sent the cake to them, I was caught by traps at the doorstep, alarm system, and saw a huge target board hanging on the wall. This brings back lots of memories – it’s been such a long time since I planned such parties for my own girls. How time flies! 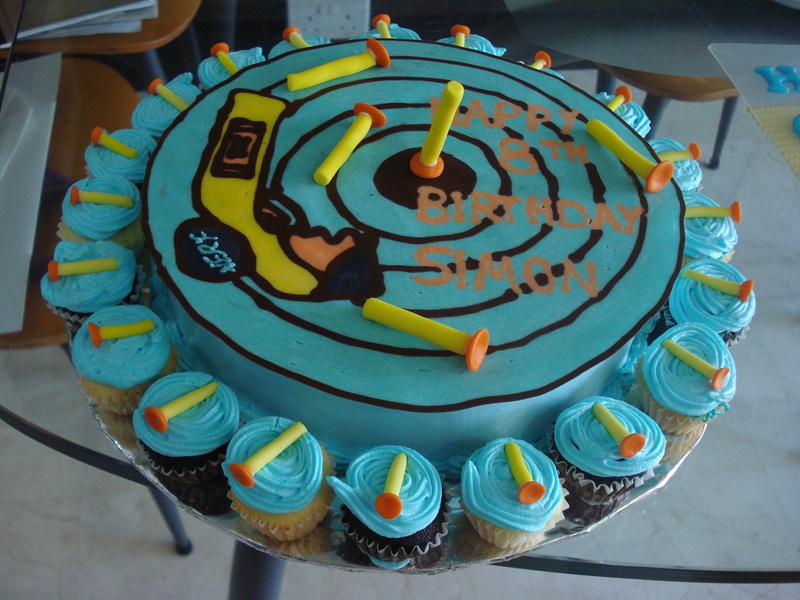 When my friend first approached me to make a Nerf Gun cake, I honestly have no slightest clue what it is – what … nerf … gun? I thought it was a typo error in the sms, something I am guilty of when in a hurry. But I gave myself a good excuse .. this is boy’s toy, and I only have 2 girls ..
On the whole, I am quite happy with the outcome, except that I should have used a darker orange so as to allow the name stand out a little more. But I am glad that the little cupcakes were well received, and the mummy had no chance to eat any bullets nor the target board as those were the target of the little boys! I absolutely love to bake, but after a while, baking is just not enough. I cannot stop marvelling at those beautifully decorated cakes in showcases and cake magazines. So from baking , I ventured into cake decorating classes. Colours and dimensions are quickly added to my bakes. There is so much to learn, so much to explore in cake decorating. Would love to use this blog to share my experiences and make like-minded friends!